Keeping up with their schedule of a new album release every decade or so, Armored Saint comes in right on time with La Raza, their first all new studio album since Revelation in 2000. Revelation was a continuation, more or less, of the style that they perfected with 1991's Symbol of Salvation. Revelation was kind of like Symbol of Salvation on steroids. Bigger, louder, and heavier. And also darned good. Really good. La Raza, however, is something different. First of all, the music was all written by Joey Vera, whereas on the previous Armored Saint albums all of the musicians contributed to the songwriting. Second, Vera and lead vocalist John Bush seemed to attempt a move to new musical ground (somewhat) this time out. The result is an album that doesn't just continue what they did on their last two Armored Saint albums, but to progress it to where they may have been had there been a couple of albums in between Revelation and La Raza. Joey Vera recently mentioned that musical progress was something they were trying to achieve with La Raza. "For me, like life, it’s all about progression. I hope to think that I become a better songwriter with each year that passes. So, my goal was to really exercise that idea." 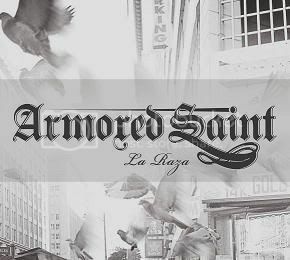 While there is no mistaking the musical stylings of La Raza as anything but Armored Saint, this isn't quite the same Armored Saint we last heard on Revelation (and Nod to the Old School). Perhaps the closest example from another band of this kind of progression from one album to the next would be Metallica from the Black Album to Load. Only the Armored Saint musical shift isn't quite that drastic or dramatic - but it's not all that far off, either. For example, lead track, "Loose Cannon," clearly sounds like uptempo Armored Saint, but it also has some new elements that are subtly added to the songwriting mix. Some of the 90's Alternative Metal melodies and chords are thrown in, as well as something of a hyperactive 70's Rock vibe, and the feel of the song isn't as pure Heavy Metal as previous Saint albums have been. That's not a bad thing, though. It's a good song, even if the hook isn't as strong as what the Saint is known for. And after an atypical organ intro, "Head On," finds the band a little more firmly on traditional Metal ground. In fact, the riff in the verse of the song is very Iommian, and would have fit in perfectly on Heaven and Hell's The Devil You Know album. It's big and bold but still loaded with melody. This is a very strong mid-tempo song with a nice tempo change to a more upbeat chorus that has echoes of several current (read: younger) Hard Rock and Heavy Metal bands circa 2010. The riff for the solo section is also very Sabbath like, by the way, so even with some of the current elements in the song it still has a classic Heavy Metal feel overall. "Head On," is probably a better song overall than it's predecessor, progressing the album forward rather nicely. Perhaps the most traditional Armored Saint song on the album is, "Left Hook from Right Field," a song that would have sounded right at home on Symbol of Salvation, Revelation, or even Delirious Nomad. It's an upper mid-tempo song with a good chorus hook and some fairly strong riffing. It wouldn't be a standout track on any of those albums I mentioned, but it would have been a solid inclusion on each of them. Some of the newer ground can be found on, "Get off the Fence," which has a vocal melody that is fairly similar to, "Fly on Your Wings," by ZO2 (from their 2004 album Tuesdays and Thursdays). "Fence," also has a riff and a groove that isn't too far removed from something Extreme might do. It's Heavy Metal, but it's kind of funky and has some 70's Rock stylings that are noticeable, even if fairly subtle. Armored Saint has done stuff like this before, but, "Get off the Fence," just takes it a little farther and gives the style a new spin. It's a great song, and one of the highlights of the album. And then things get interesting. When, "Chilled," starts you could be forgiven if you thought that maybe they had collaborated with the guys from Queensryche (especially in between the Operation Mindcrime and Empire albums). This is a moody song with a grooving, but not particularly heavy verse that builds to a heavier, but still moody chorus. This is unlike anything that the Saint has done before. While this isn't a great song it is a good one. Both this song and it's predecessor make effective use of harmony vocals in a way not usually associated with Armored Saint. Then Joey Vera's time with Prog Metal stalwarts Fates Warning shows very clearly on the album's title track. This is clearly a Progressive Metal song played in Armored Saint's ever so slightly rough around the edges style. Musically this is a very, very strong song with some serious substance. The only thing it lacks is a strong hook. It's got some killer riffing, though, so that is somewhat forgiveable. The partly acoustic, and very dynamic, "Black Feet," sounds very much like Armored Saint, and has it's stylistic roots in their song, "Tainted Past," from Symbol of Salvation, only this song really hits all the 90's Hard Rock and Alternative Metal notes. With John Bush giving the vocal delivery the song doesn't stray too far from traditional Metal, but clearly the new elements are there - including some slide guitar blues elements not often heard in Armored Saint songs. Again, this is a good song (arguably very good), just not a great one. Then things get Punky (and smell funky) with, "Little Monkey," which has some 90's and 2000's Punk elements standing out in a not so subtle way. It's a high octane, uptempo burst of energy that is infectious and fun. If they were to release a 2nd song to radio this would be a great choice as it could have some real appeal to younger music fans (without alienating their older fans). They slow the tempo back down a bit for, "Blues," which, despite it's title, isn't all that bluesy. It is a mid-tempo song with a fairly strong sense of melody, but doesn't have much that stands out (besides some Alice in Chains-esque melodies here and there, and maybe some bits of AIC-like harmony vocals). Again, a decent song that might have fit on Delirious Nomad, but not as a standout track - just a solid album cut. The lack of a strong chorus hook definitely hurts this one. It's not bad, but it's not as good as it should have been. "Bandit Country," is just, well - weird for Armored Saint. The clean, almost R&B-esque rhythm guitar parts in the verse and bridge and the fairly funky beat are not totally without precedent in the Saint's history, and the chorus is not too far removed from some stuff from Delirious Nomad (that album is coming up a lot here, isnt it? ), but this isn't as cohesive a song as it should be, and it almost seems like they're going for a more epic album closer, but forgot to include the epic chorus hook. The vocal melodies are OK on this one, but nothing to write home about. Musically, this song is very adventurous and ambitious, but as a song, "Bandit Country," is still lacks something in it's overall execution. Yet again, we're talking about a good song, but one that with further development (and maybe a little tightening up of the arrangement) could have been great. And that really sums up the album. It's good - very good in spots - but it just isn't great (whereas the last two Armored Saint studio albums were). That would include the overall sound of the album, as well. The audio production on La Raza is good, but it, too, could have beena little better. Revelation had a better sound, overall, than La Raza, and had there been more bass in the mix for Symbol of Salvation that album, too, would sound better than La Raza. Don't misunderstand - La Raza sounds good, very good, but Joey Vera himself set that bar rather high after the job he (and Bill Metoyer) did on Revelation. Even so, it's a very enjoyable album to listen to, and may hold up well over time. Most Armored Saint albums do.